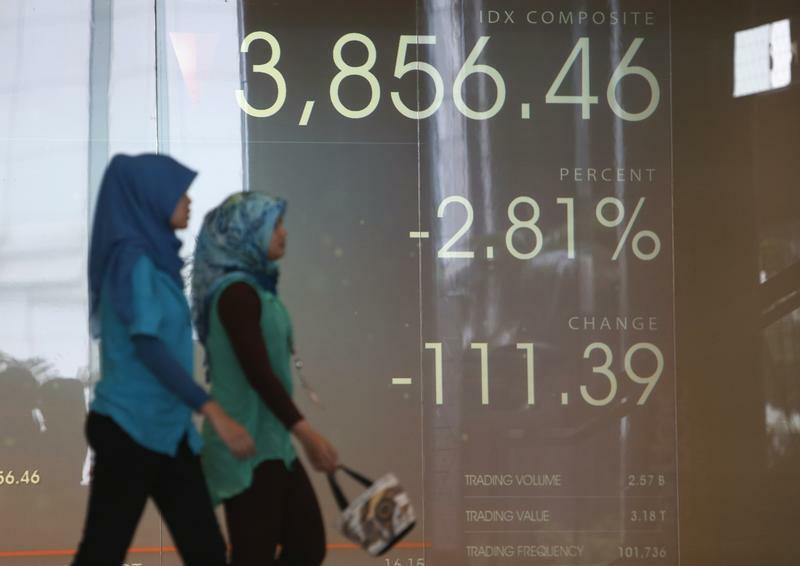 Women walk in front of a screen of the Indonesia Stock Exchange in Jakarta August 28, 2013. Indonesia’s central bank on Aug. 15 raised its benchmark interest rate by a quarter of a percentage point to 5.50 percent, its fourth hike since mid-May. Twelve of the 19 analysts surveyed by Reuters had expected interest rates to be left unchanged. The rupiah hit a low of 14,646 per dollar on Aug. 15, the weakest since October 2015. It was trading at 14,565 at 0813 GMT. Indonesia on Aug. 15 reported a larger-than-expected July trade deficit of $2.03 billion, compared with analysts’ expectations of $600 million, according to a Reuters poll. Finance Minister Sri Mulyani Indrawati said on Aug. 14 that Indonesia would introduce “corrective” measures to support the currency, including a 7.5 percent import tax on 500 consumer goods that Indonesia can produce locally. The products have not yet been named.